By Sharon Hibbitt I spent two years piecing together Bert Hibbitt’s journey from his postcards, family stories and battalion diaries. At last we felt we had enough information to make the journey to Belgium and France ourselves. The time was right. Entering Belgium I saw a CWGC cemetery almost immediately and it hit home where we actually were. I am still shocked by the number of cemeteries and marvel at how beautifully kept they all are. Each grave holds a son and a story possibly untold. I wish Bert and all the other soldiers could see the peace and beauty of them today. It was very surreal knowing I was actually walking in his footsteps and I would often stop, look around and try to imagine how it must have looked, sounded and even smelt 100 years ago. Each night we went to The Last Post at the Menin Gate. Each night was different and I enjoyed listening to the little story they told of a different soldier, even though it bought tears to my eyes. 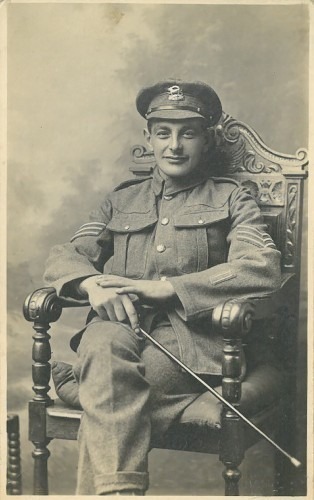 There is a record of Bert being treated for an injury in September 1915. I believe he was wounded in Sanctuary Wood near Ypres and I did feel very connected and emotional at a particular area there but I can’t explain why. I laid a cross for him and also paid my respects to the soldiers in the cemetery nearby. I also found it peaceful sitting in Maple Copse, an area he would have known in the reserve lines and where he would have rested. My favourite view was sitting at Mount Sorrell were I could see Ypres, Maple Copse and Sanctuary Wood all at the same time. I also visited Zillebeke which he would have known and where the wounded were treated at Railway Dugout. I drove along the road he marched down from Wytschaete to Wulverghem and even had a laugh going to Bailleul where the soldiers were able to call upon the services of Tina!!!!. My journey to France felt sadder as I knew this is where he was gassed twice. Philosophe Cemetery was the hardest of all. Here I saw a headstone from the Leicestershire Regiment with an army number just six higher than Bert’s. They had died at the time Bert was injured by gas so one of the graves could so easily have been his. Was he one of the lucky ones to have made it home to die surrounded by his loved ones at home? He was always ill and in pain and left behind a wife who never remarried and a son who only knew his father for three years. But had he not been gassed he would not have met his wife at all. I am so very proud of him, his life and the legacy he has left behind. He will always be my hero.